I always love it when samples from a winery who I like – but don’t normally get samples from – turn up at the door. It’s like a wine Christmas. St Mary’s are intriguing too, if more for their geopolitical history than anything else. They were one of the losers when the Coonawarra boundaries were redrawn. What’s most frustrating about the Coonawarra boundary redistribution – which pushed St Mary’s into the Limestone Coast GI – is the contradictions. Hectares of unfavourable rendzina ‘black goo’ and mixed, highly variable podzolic soils to the border to the east were included. Yet genuine ancient limestone ridges, such as the one that St Mary’s sits on just 15km from Penola, were excluded. It’s a perplexing situation, particularly if you’ve ever driven through the scrub towards the border. Ditto if you’ve watched how quickly the terra rossa runs out to the west. Anyway, because St Mary’s is its own little island, it must be labelled as Limestone Coast rather than Coonawarra. For more information about the boundaries and geology, have a read of this detailed report. 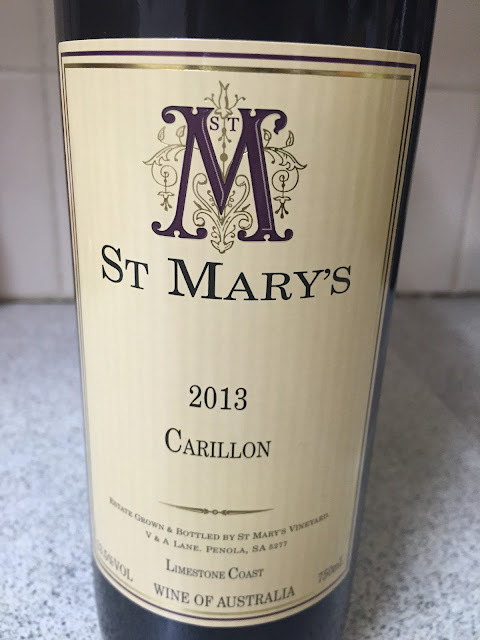 This Carillon blend is a handpicked mashup of red varieties, covering off Cabernet Sauvignon, Shiraz, Merlot and Cabernet Franc. It’s a basket pressed, open fermented and utterly Aussie blend, complete with old school packaging. It smells very Aussie too – mid red, with just a little purple, there is Eucalypt in abundance (much like Wrattonbully, which can also carry some gumleaf notes). The mid weight palate is classic Coonawarra – leathery, sufficiently rich but not decadent, with firm acidity and a buttress of drying tannins. The only challenge is how potent the Eucalypt is, edging the whole wine. Still, I like the old school charm here – it’s a bit spiky and hardly seductive, but the integrity of fruit and flavour is admirable. This will live for a very long time. Details: 13.5%, Cork, $40. Best drinking: 2020-2035+. 17.5/20, 91/100+. Would I buy it? Not yet. Like to see it in 15 years time though.